Food will be provided to all youths that participate in the Recreation Worcester Program provided by the Worcester Public Schools and/or Friendly House. Transportation will not be provided by Recreation Worcester. 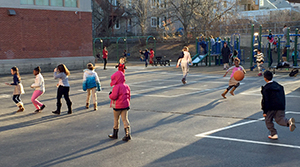 Recreation Worcester's School Year program offers students in grades 2-12 the opportunity to engage with volunteers, on-site personnel and other community partners in enriching, recreational, academic, and art programming. By enhancing these partnerships, Recreation Worcester aims to develop linkages between youth and community leaders through mentorship. WHERE: Canterbury Elementary, Chandler Magnet Elementary, Nelson Place Elementary, Quinsigamond Elementary and Vernon Hill School. WHEN: The program begins on Nov. 7, 2018. COST: Participation is free for Worcester students in grades 2-12. Can children walk to and from the school/park, or do they need a parent to drop them off/pick them up? Children may walk to and from the school/park at the discretion of each parent. The parent will allow this through the registration process. Can the child go to any school/park, or do they have to go to the one in their neighborhood? Yes, they can go to any school/park in session. Can they go to different schools/parks each time, or are they locked in once they choose? They can attend any school/park at any time. Do children register once at the beginning of the program? Once for each school/park? Once per visit? Children are registered only on the first visit to any participating school/park; it's a universal application for the program. How many employees will be at each site? Between 4 and 5 staff in each school and 7 to 10 staff in each park at all times. No deadline; there is a rolling admission. What happens if the parent can't pick up their child on time? All parents must pick their children up by dismissal time for that particular school, however if they are running late they must call the coordinator of the site. There is a policy for excessive lateness within the program. Who should we call with questions? Who is Customer Service's contact person? There will be food provided to every participant.